Every year, more than 25 percent of the students receiving a degree in engineering at NC State University are students who began their education at another institution. They come from community colleges, four-year colleges and universities, and from institutions in foreign countries. Transfer students are a valuable part of the College of Engineering and NC State University. We appreciate your interest in pursuing a career in engineering at NC State, and we are ready to help you accomplish your goal! Engineering is a profession filled with opportunities, challenges and rewards. Selecting the tabs below will answer many of your questions about transferring to the College of Engineering. Review the engineering transfer admission requirements before applying. The numbered list below contains the minimum requirements to be eligible to apply and be considered for transfer into the College of Engineering at NC State. Since transfer admissions into the College are very competitive, meeting the eligibility requirements only guarantees that a transfer application may be considered; it does not guarantee admission. As such, the minimum requirements listed here should be used as a baseline. The NC State University course number is written in parentheses for your reference. A course taken at another institution must be equivalent to the exact NC State course and completed with a grade of C- or better. If NC State courses are taken, the overall NC State GPA must be at least 2.0. Core courses (chemistry, calculus and physics), also known as C-wall courses, require at least a C.
†Please note that the requirements above are minimums for eligibility to transfer into the College of Engineering. Due to high demand, some programs are much more competitive and preference is given to higher GPAs. In some cases, applicants with 3.0 ≤ GPA < 3.5 may increase their competitiveness with strong performances in additional, technical coursework (e.g., Calculus III, Physics II, Engineering Statics, Chemistry II, Organic Chemistry, etc.). To select the appropriate courses, refer to your intended NC State engineering degree requirements. 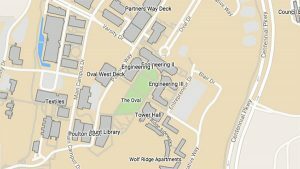 Once you meet the transfer admission requirements or will have the last requirements completed by the end of the spring semester, you are ready to apply to NC State’s College of Engineering. The College of Engineering accepts applications only for fall transfer. Application information (deadlines, how to submit transcripts, application, etc.) can be found at NC State Admissions. Select a tab below for more information. If you are an international student, please consult the university’s transfer information for more details. Whether you are a prospective transfer student or newly admitted, you may have some questions about transferring into the College of Engineering. Here are some of the most frequently asked questions that transfer students have. Am I considered a transfer student if I already have a degree? Yes, any student who has taken college-level courses after graduating from high school is considered a transfer student. We have had transfer students with Associates, Bachelors, Masters and PhDs! Can I take the required courses at NC State before I’m admitted? Yes, you can take courses part time through Non-Degree Studies (NDS). Please note that there are limitations to the number of hours per semester that you may take. Also, please keep in mind that courses taken as an NDS student contribute toward your NC State GPA. What if I’ve taken all the required courses but my GPA is a little too low according to the transfer requirements? In some cases, applicants with 3.0 ≤ GPA < 3.5 may increase their competitiveness with strong performances in additional, technical coursework (e.g., Calculus III, Physics II, Engineering Statics, Chemistry II, Organic Chemistry, etc.). Please see the Engineering Degree Requirements to find additional coursework within our curricula. See NC State Undergraduate Admission Requirements and College of Engineering Transfer Admission Requirements. Does work experience or military experience count as transfer credits? Neither work experience nor military experience counts toward transfer credits. How can I know what courses will transfer? See Transfer Course Equivalencies. If you find that one of your courses is not yet listed in the database, you may inquire with a College of Engineering academic advisor. Priority is given to transfer course evaluations for required transfer courses. Does my AP/IB credit count? Yes. AP/IB credit will be accepted according to university standards. While this credit can be used to complete transfer course requirements (ex. a 4 on AP Chemistry is awarded CH 101 & CH 102 and CH 201 & CH 202), these credits do not contribute toward the minimum credit hours required for transfer (30 hrs). What if I am missing an hour of English composition? Four credit hours of English composition are a strict requirement for admission into the College of Engineering. However, there are several special circumstances that are covered on the First Year Writing Program website. Check to see if you fit into one of the categories described. Can I transfer credit for E 115? No. This course must be taken at NC State since it is an introduction to our computing and networking system. Am I expected to have a computer? While not required, the College of Engineering recommends that all incoming undergraduate students, both freshmen and transfers, have a laptop meeting the required specifications. See Student Owned Computing. Should this expectation present a hardship, contact Student Owned Computing to discuss your options. After I’m accepted, how do I register? After you return your confirmation form and pay your deposit, you should check MyPack Portal to see if a degree plan and advisor have been assigned to you. If so, you are ready to seek advising from your assigned advisor. After I’m accepted, who will my advisor be? Advisors are assigned by program. Please see our list of Coordinators of Advising. In some cases, however, you may first be advised by a transfer advisor from the College of Engineering Academic Affairs. This is most often the case for international students and students transferring from schools on the quarter system. Scholarships are available to College of Engineering transfer students. In addition, the university offers many types of financial aid. Co-op programs are also available to give students real-world job experience while pursuing their degrees. Be sure to read the College’s Transfer Admission FAQS above. Also, check out the University’s transfer information, including engineering admissions criteria for transfer students. In addition, you can contact the Office of Academic Affairs. After you have carefully reviewed the transfer admission Web pages, please feel free to call us at (919) 515-3263 to ask questions or schedule an appointment. We just ask that you call ahead so we know to expect you.